This Leica Pinmaster II Golf Rangefinder is a masterpiece in itself with Leica’s First Target Logic, automatic ambient-light LED display, and 7X magnification. It’s also a sight to be seen with its carbon-fiber-reinforced body, its long-reaching distance capacity of 825 yards, and it will have bright, crisp, and sharp images at all times with its roof prisms and phase correction coatings. This is the tournament-legal golf rangefinder like none other on the green. The Leica Pinmaster II is still relatively new to the market. Like its predecessor, it sports the same slim and light feel that made the original model so appealing to its buyers. What has been said in reviews is that you can expect the high-quality optics you’d expect from Leica. All reviewers agree there’s no competition when it comes to crisp and sharp image clarity from this unit. Update - 2017.06.21Leica launched the Pinmaster II Pro in 2016/2017 which combines the first-rate technology of the older Pinmaster II with slope technology for angle compensation. Check it out here. If you’re reading this review, you’re either a die-hard Leica fan or you’re about to be. This German brand has been around for ages and it can safely be said that they are the authority on quality optics. From professional camera lens to the sports industry, Leica has proudly touted their German engineered optics to be the best. 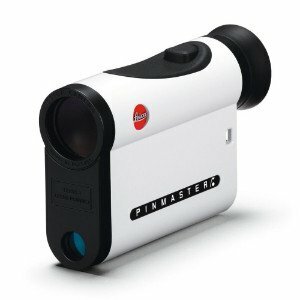 Taking their turn at dabbling in the golfing world, let’s see if Leica’s legendary quality control is passed on to the Pinmaster II. Leica’s golf laser rangefinder is supposed to have it all. You should be able to expect great optics, easy accessibility, water tightness, fast and exact distance measurement, and steadiness with one hand use. That’s all you need in a golf rangefinder right? And, that should be exactly what you’re getting when you dish out the moolah for the hefty price tag that’s attached. Well, let’s see if the Pinmaster II holds up to your expectations with our extensive Q&A. How does it acquire targets? This is one of those fundamental questions that determines whether or not the Leica unit is going to be appropriate for your golf game or not. Leica designed the Pinmaster II with First Target Logic. This means it’s going to give you the line of sight distance of the nearest target when several target distances are available. When aiming at the flag, you’ll know you’ll get the flag’s distance and not the surrounding trees in the background. This First Target Logic feature is why this is the unit for your golf game. How clear is the image on the Pinmaster II? Leica is extremely proud of the quality of their lens, and for good reason too. They actually do provide high quality optics with 7X magnification that’s ideal for long distance acquisition and viewing. In fact, 7X magnification is the highest magnifying power you can get for a golf rangefinder. With rangefinders, image clarity is vital since badly lit, decreased visual quality, and distracting, illuminating displays can affect your game. Fortunately, this particular unit enhances natural color and images by improving contrast and resolution with a roof prism system with a P40 phase correction coating. This means sharp, clear, and pristine images every time you step onto the green. Is the Leica digital laser rangefinder easy to use? This new model of the original Pinmaster has been greatly improved as far as ease of use. Surprisingly, the older model was difficult to depress. It required excessive pressure for a rangefinder, and this can make all the difference for a golf user. Fortunately, this rangefinder has been redesigned to be much easier to press. Like most other rangefinders on the market, it keeps things simple and sports only two buttons: the power/firing button and a smaller button for switching between measuring systems, yards or meters. How long does it take for readings to be displayed? Practically instantaneous. The Leica Pinmaster II is not only very simple and easy to use, it’s extremely fast. You can expect a reading in less than a second. To be precise, the maximum reading time takes 0.85 seconds. Pressing the firing button once to power up will display the reticle on the screen. Pressing it again will give you an immediate reading. Pressing it a second time and holding down for approximately three seconds will put the rangefinder into Scan Mode and will provide you with half second updates of various target distance readings. How watertight is this unit? You should expect nothing less than a 100 percent waterproof unit when you’re forking over the prices you’re paying. Good news: The Leica unit is not only fully waterproof, it can also survive submersion up to three feet. This means, the next time it starts to sprinkle during your 18 hole game, there’s no excuse to stop. In fact, let it rain, let it thunder, let it storm. Your Leica is most likely more waterproof durable than you are. What color is the display? The LED screen sports Leica’s red display. Not only is this different to nearly all other rangefinders on the market, the red display will automatically adjust itself to the amount of ambient light available. You’ll be able to perfectly view the display whether the midday sun is out or if it starts to rain on you. What kind of reticle does the laser rangefinder have? The Leica golf rangefinder has only one reticle available to use. It’s a small one-eighth inch square. This actually makes for an uncluttered screen which makes it easy to see the flag and the green. However, it would be nice if there was at least one more option to be able to change the reticle for preference sake. Is there a battery life indicator? This particular unit doesn’t display a battery life indicator. This can be an issue if you’re wanting to know if it’ll last your entire game. The CR2 lithium ion battery will last you approximately 2000 ranges, but it’ll be less if you use the scan mode more often. The reticle and reading on the display will start to blink once you’re down to about 100 ranges left. Lesson to be learned here? As unobtrusive as a lithium ion battery is, there’s no excuse to not always carry a spare with you. Does the Pinmaster II come with any additional accessories? The laser rangefinder is supposed to come with a Cordura case and can also come with a carrying cord. Of course the option of buying the unit with these accessories depends on where you’re buying the rangefinder from. How good is the Pinmaster 2 rangefinder at locking onto pins? This is probably the most important aspect of a golf rangefinder. Quality field testing and reviews reveal that the Pinmaster II performs quite well when locking onto a flagstick. You’re not going to have any problems when targeting a pin within short distances. Up to 200 yards, you’re still going to get high performance from the unit because you have the 7X magnification. Unfortunately beyond 300 yards, you’ll need to lock onto the actual flag or the hole to get an accurate reading. Ranging to the flagstick alone could result in the unit acquiring a distance from a target in the background. This could happen since the unit can struggle to lock onto the target if it doesn’t take up the space of the crosshairs. Bottom line? Leica could’ve made this unit with a higher target sensitivity. How convenient or portable is it? 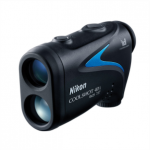 This rangefinder has an ergonomic and very compact design. Its dimensions are 4.5 x 1.2 x 2.2 inches. Even with its compact and small design, there’s still the issue of how convenient it is to tote around. The carrying cord can be worn around the neck for quick accessibility, but the hanging rangefinder can interfere with positioning for a swing. The Cordura case for the rangefinder has a loop in it so that it can be attached to a belt for convenience. The downside to this is that it may be tedious to have to pull it out and put it back in the case every time you need it. Despite all this, the extremely slim design does make your pocket a convenient storage place while on the green. What would be nice is if it could be easily attachable to your golf bag. Overall, on the accessibility and portability aspect, I’d say Leica could have put a little more thought into it. If you’re still trying to decide whether or not the Leica is for you, then let me help you out. This entry level rangefinder is a great tournament legal unit since it only provides line of sight distance. If you’re okay with your pocket practically being the only appropriate holding place, then you’ll appreciate its ergonomic and small design. The Pinmaster II performs very well if your game consists of shorter distances under or around 200 yards. If sharp and clear optics are important to you, then it should make up for the lower performance of target acquisition beyond 300 yards. All in all, you’re spending quite a lot for this small unit, but it could be worth it if you value image quality. Leica is the best in its field when it comes to producing high quality and high performance optics, and the Pinmaster II is definitely part of the Leica family. Rangefinder Target Modes - How Can They Benefit Your Golf Game? I am a Tiger Wood's wannabe who was all set to become a professional golfer until an injury cut my potential epic rise to fame down. :-). Now you will mostly find me watching golf, or at my local putt putt reminiscing about what could have been. Are Golf GPS Devices & Rangefinders ‘Legal’ for Tournament Play? Golf Rangefinders: Are They a Benefit or Hindrance to the Game? 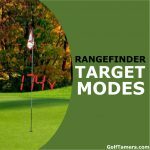 Rangefinder Target Modes – How Can They Benefit Your Golf Game? Copyright © 2019 Golf Tamers. All rights reserved. Golf Tamers is a participant in the Amazon Services LLC Associates Program, an affiliate advertising program designed to provide a means for sites to earn advertising fees by advertising and linking to amazon.com.